newsletter » Singer, songwriter, multi-instrumentalist, producer: Daniela Nardi is a smoldering, passionate performer, with an enticing voice. 2007 Ontario Economic Outlook And Fiscal Review » Special Province of Ontario Economic Statement e-newsletter published by Audit, Tax and Financial Advisory Services Firm. Newsletter 12_2007 » Showcase of Cuban music in Canada. Drop by for Special Treats at The Wine Establishment » Inspired By Wine. Canada’s Most Trusted Wine Accessory and Wine Storage Provider. December 2007 » Holiday Buyers Guide And Events Update. e-newsletter published by Toronto-based retailer of percussion equipment and teaching/ training education. 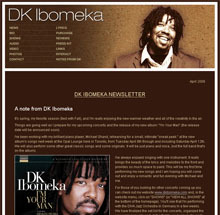 e-news 07.12 » 1st Edition Of The DK Ibomeka e-newsletter. Autumn 2007 » Quarterly e-newsletter published by Audit, Tax and Financial Advisory Services Firm. e-news 07.12 » Prepare yourself for the Year Of The Piano... and other upcoming events. Shop This Christmas At The Wine Establishment » Inspired By Wine. Canada’s Most Trusted Wine Accessory and Wine Storage Provider. e-news 07.11 » Robert Scott CD release @ Lula Lounge, Martini Bar at Pantages Hotel, Celebration Concert in memory of Doug Riley, JAZZOETRY, and other upcoming events. Join TWE at the Gourmet Food & Wine Expo » Inspired By Wine. Still Canada’s Most Trusted Wine Accessory and Wine Storage Provider. 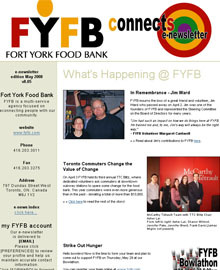 e-newsletter » FYFB Holiday Open House, Queen West Art Crawl Welcomes FYFB Again, FYFB participates in the Scotiabank Toronto Waterfront Marathon, FYFB Holiday Fund Appeal, and Holiday Season Gift Cards. 2007 Federal Economic Statement Review And Analysis » Special Federal Government Economic Statement e-newsletter published by Audit, Tax and Financial Advisory Services Firm. Pt II. Phone service restored notice to clients. Pt I. Emergency notice to clients about phone service outage. Newsletter 10_2007 » Showcase of Cuban music in Canada. e-news 07.10 » William Carn and Nancy Walker performances at The Rex Hotel, Martini Bar at Pantages Hotel, JAZZOETRY, and the JAZZ.FM91 Sound Of Jazz concert series. Newsletter 09_2007 (II) » Showcase of Cuban music in Canada. Saturday Sale at The Wine Establishment » Inspired By Wine. Still Canada’s Most Trusted Wine Accessory and Wine Storage Provider. September 2007 (II) » Special events edition of monthly e-newsletter published by Toronto-based retailer of percussion equipment and teaching/ training education. September 2007 » Quarterly e-newsletter published by Audit, Tax and Financial Advisory Services Firm. Newsletter 09_2007 » Showcase of Cuban music in Canada. e-news 07.09 » ADAM MAKOWICZ performs live @ The Courthouse, ROBERT SCOTT meets GREAT BOB SCOTT @ Pantages Hotel, The Rooftop @ The Owl And Firkin and an October Preview. September 2007 » Monthly e-newsletter published by Toronto-based retailer of percussion equipment and teaching/ training education. enews 2007.08 » Inaugural edition of bi-monthly newsletter published by Toronto Canada based photographer capturing fashion, interior, people and product images. July 2007 » Monthly e-newsletter published by Toronto-based retailer of percussion equipment and teaching/ training education. e-newsletter » FYFB Strikes Again Bowl-A-Thon Update and photos, Mid-Year Update, Volunteer Profile - The Lunch Sisters, FYFB Fan Mail, Walk for Values, The Mabin School Donates Food, FYFB Sparkles and upcoming events. Newsletter 06_2007 » Showcase of Cuban music in Canada. Special Invitation » Carnavallissimo Festival at Harbourfront. Toronto. Wine At The Castle - Saturday June 16th 2007 w/ York University Foundation » Join us for an afternoon of fine wine tasting, exquisite food and an exclusive live and silent wine auction, accompanied by live music by York University's Faculty of Fine Arts musicians. e-news 07.06 » DK IBOMEKA, ZAREINU MOVEATHON 2007, EVIL DEAD: THE MUSICAL, JUNE 17 Fathers Day Special, 2007 PRIDE AWARDS GALA, CHIN International Picnic 2007, ELECTRIC ECLECITCS 2007 and TD CANADA TRUST TORONTO JAZZ FESTIVAL 2007. June 2007 » Inaugural e-newsletter published by Toronto-based retailer of percussion equipment and teaching/ training education. June 2007 » Quarterly e-newsletter published by Audit, Tax and Financial Advisory Services Firm. Newsletter 05_2007 » Showcase of Cuban music in Canada. Festa Da Bateria! » @ Lula Lounge. Thursday May 24.
e-newsletter » FYFB Bowl-A-Thon May 31, Why I Give interview w/ Ann Armstrong, FYFB Volunteer Profile - John Roussos, FYFB Mailbag, and upcoming events. 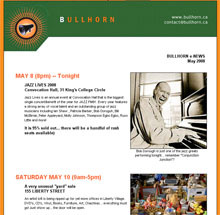 e-news 07.05 » JAZZ LIVES After Party, WORLD LAUGHTER DAY 2007, Brandi Disterheft "DEBUT" CD Launch, THE 6TH ANNUAL JAZZ ON THE RIDGE and TD CANADA TRUST TORONTO JAZZ FESTIVAL 2007. Join The Wine Establishment @ Two Great April Events » Inspired By Wine. Still Canada’s Most Trusted Wine Accessory and Wine Storage Provider. Newsletter 04_2007 » Showcase of Cuban music in Canada. Come Celebrate Spring, Brazilian Style! » @ Lula Lounge. Friday April 6. Join The Wine Establishment @ decant 2007 » Inspired By Wine. Still Canada’s Most Trusted Wine Accessory and Wine Storage Provider. e-news 07.04 » MONKEY TOAST (The Improv Talk Show), Shuffle Demons Close Out Tuesday Night Jazz at LULA LOUNGE season, Jaymz Bee’s 44th BIRTHDAY BASH @ THE GLADSTONE HOTEL, NATIONAL JAZZ AWARDS, PANTAGES HOTEL PIANO SERIES and JAZZ LIVES (3). 2007 Ontario Government Budget Review & Analysis » Special Government of Ontario Budget e-newsletter published by Audit, Tax and Financial Advisory Services Firm. 2007 Federal Budget Review & Analysis » Special Federal Budget e-newsletter published by Audit, Tax and Financial Advisory Services Firm. e-news 07.03 » Tuesday Night Jazz at LULA LOUNGE, Jaymz Bee’s 44th BIRTHDAY BASH @ THE GLADSTONE HOTEL, DK Nominated for Male Vocalist of the Year at the NATIONAL JAZZ AWARDS, MONKEY TOAST (The Improv Talk Show), and SCRABBLE w/ the Stars. Newsletter 03_2007 » Showcase of Cuban music in Canada. In Performance » INNONATION and the Hong Kong Blues Society present Genevieve Sings The Blues. Saturday March 10 2007. Winter 2007 » Quarterly e-newsletter published by Audit, Tax and Financial Advisory Services Firm. Annual Clearance "Courtyard Sale" » Inspired By Wine. Still Canada’s Most Trusted Wine Accessory and Wine Storage Provider. Newsletter 02_2007 » Showcase of Cuban music in Canada. Get ready -- here comes Carnaval 2007 » w/ events at Lula Lounge, Liberty Grand and Tonic in Downtown Toronto. e-news 07.02 » Tuesday Night Jazz at LULA LOUNGE, Nu Jazz at THE GLADSTONE HOTEL, Cabaret U-Mano at the Diesel Playhouse Mainstage and COLLEEN ALLEN’s official CD Launch. Shareholder Alert » InterRent REIT Announces $50 Million Offering of Trust Units. e-news 07.01 » Tuesday Night Jazz at LULA LOUNGE, Archie Alleyne's Such a Melodious Racket, Nu Jazz at THE GLADSTONE HOTEL and COLLEEN ALLEN’s official CD Launch. Shareholder Alert » InterRent REIT Announces $50 Million Fully-Marketed Offering of Trust Units and Agreements to Acquire $100 Million of Multi-Residential Properties. Newsletter 01_2007 » Showcase of Cuban music in Canada. 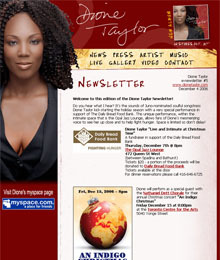 e-newsletter » Season of Joy, Holiday Fund Appeal, The Five Days of Christmas, Winter Relief Fund, Thank you for dancing! and Thank you for listening!